Hiya, everybody! Today we’re rolling out so long-waited brill features of Mighty Grocery shopping list. Check ’em out! As always, looking forward to your suggestions! I’m attempting to set the default tax rate and I don’t find out in my settings list. Is this something that is only available in the upgraded version? 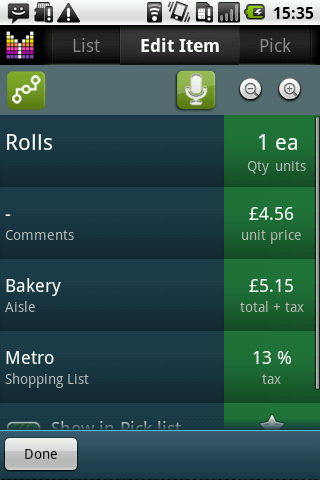 So far I love the app but I only used for making my shopping list at this point. Once I actually take it to the store I do my shopping I’m sure I’ll upgrade if it works as expected. Hi Patricia, thanks for your question. Default tax rate can be set both in Free and Full versions. Just open details of an item, set its tax rate, then tap the Tax field again and choose “Set as default”. Please let me know if you have any further questions or comments. I can’t seem to figure out how to change the decimal separator from “#” to “.”, when entering prices for items . The # sign automatically changes to “.” in the price, but I would still like to change it if possible. I’ve verified that language settings are US English, but I can’t seem to find “locale” setting. Any suggestions? Beth, Mighty Grocery uses decimal separator setting of your current locale. Unfortunately, currently there is no way to change display settings of decimal separator. However any character will be treated as decimal separator when you enter decimal values in the app. Hopefully this helps. In Texas, tax is calculated on the full value of an item. In other words, if an item costs $3.00 and I have a $1.00 coupon, I will be charged tax on $3. It looks as if MG subtracts the coupon and then calculates the tax. Is this correct? If so, is there a way to change it? Liz, thank you for your feedback and your question. Kindly note that latest Beta 19 update has introduced ability to calculate tax before applying discount. Once you have assigned coupon to an item, just tap Coupon/Discount field again and choose “Apply tax before discount”.